Former F.B.I. Director James Comey, in an interview in New York on Sunday, responded to recent criticisms from President Donald Trump, who called him dishonest and accused him of lying in a Congressional hearing last week. Comey also said Democrats "have to win" the 2020 presidential election. Trump posted several tweets attacking Comey over the weekend after he testified before the House Judiciary and Oversight committees in a closed session on Friday, but the ousted F.B.I. chief said he mostly shrugged it off. "We have to remind ourselves that the president of the United States of America is publicly announcing that people are committing crimes, they should be in jail -- private citizens -- that's not OK," Comey told an audience at 92Y in Manhattan. "And if we become numb to it, we risk surrendering the norm." 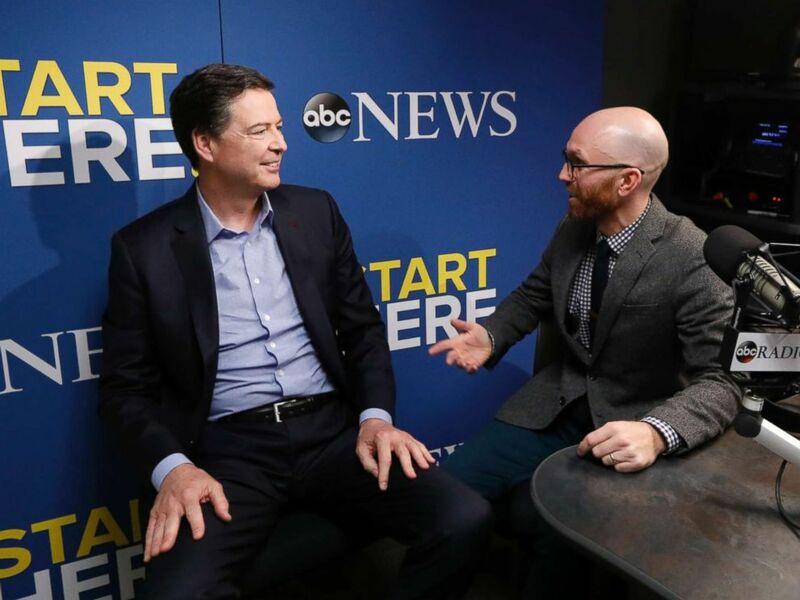 Former FBI Director James Comey speaks to host Brad Mielke on ABC News' "Start Here" podcast on April 17, 2018. His comments came just hours after Trump claimed, without evidence, that "leakin'" Comey had lied in his House testimony. "On 245 occasions, former FBI Director James Comey told House investigators he didn't know, didn't recall or couldn't remember things when asked," Trump tweeted Sunday. "Leakin' James Comey must have set a record for who lied the most to Congress in one day. His Friday testimony was so untruthful." In another tweet on Friday, Trump said: "It is being reported that Leakin' James Comey was told by Department of Justice attorneys not to answer the most important questions. Total bias and corruption at the highest levels of previous Administration. Force him to answer the questions under oath!" Comey said the president's tweets were "disturbing," but he stopped short of saying they should be counted as witness tampering in special counsel Robert Mueller's Russia collusion probe. 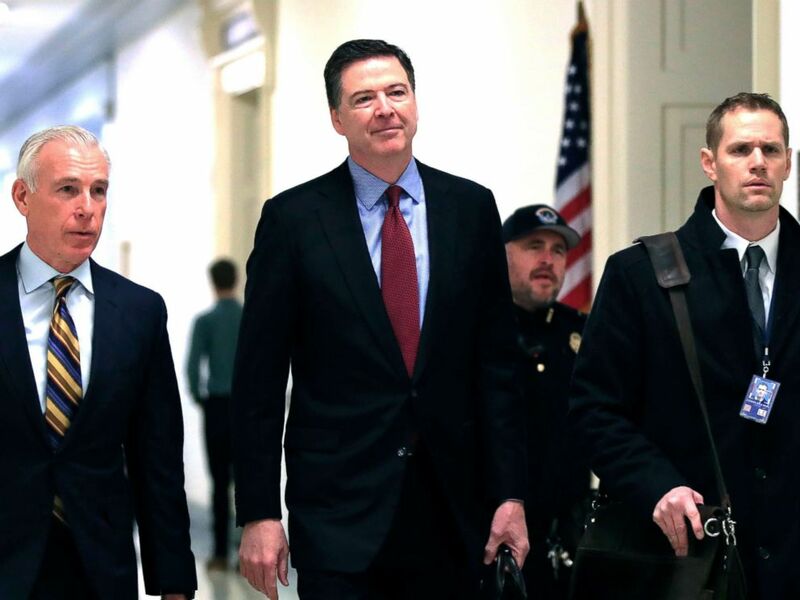 Former FBI Director James Comey, with his attorney, David Kelley, left, arrive to testify under subpoena behind closed doors before the House Judiciary and Oversight Committee on Capitol Hill in Washington, Dec. 7, 2018. 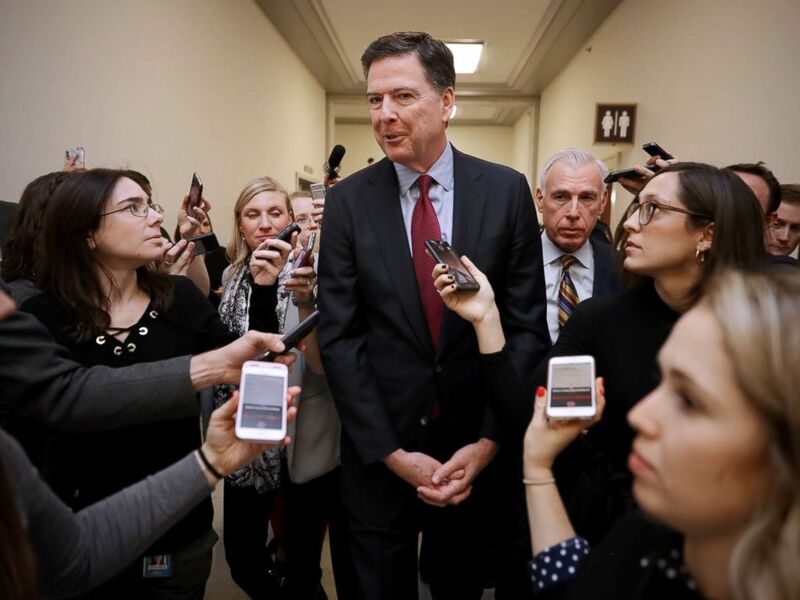 James Comey is surrounded by reporters after testifying to the House Judiciary and Oversight and Government Reform committees on Capitol Hill, Dec. 7, 2018. "I'm not prepared to judge it," Comey told MSNBC's Nicolle Wallace at the event. "I'm a witness, potentially. I don't know how the special counsel thinks about it, but if I were a prosecutor and a public figure started attacking the credibility of one of my witnesses in a pending investigation that's something I would look at very closely." Comey, who was fired by the president in 2017 over his handling of the probe into Hillary Clinton's use of a private email server, urged Americans to hold Trump accountable in the lead up to the 2020 election. "I can tell you that all of us should use every breath we have to make sure the lying stops on January 20, 2020," he said. "I understand the Democrats have important debates now over who their candidate should be ... but they have to win. They have to win." However, Comey stressed he doesn't want the president to be impeached because to do so would let "the country off the hook." "Removal by impeachment would muddy that. ... We need a clear jump upward," Comey said. "It will come from tens of millions of Americans who don't vote, voting their values."